A roofing manufacturer with a different approach. Metal roofing for commercial and residential applications. We pride ourserlves on providing quality products with exceptional services. Metal Roofing Systems is invested to ensure all projects we provide material for is a success. A constant commitment towards customer service and product development allow us to be the critical success factor for our customers. We provide more than just panels. Metal Roofing Systems manufactures complete systems for metal roof, wall, and soffit applications. We manufacture all of our flashing and roof drainage components to meet project specific conditions. In addition to our panel systems, we offer ANSI/SPRI ES-1 certified perimeter edge metal components to meet wind loads up to 150 mph! Metal Roofing Systems prides itself on being an extension of quality and service to those we provide products to. It is always our goal to make you look good on the job and assist in any way to assure a smooth and successful installation. Need help installing standing seam roof flashings? Check out our roof flashing tutorial videos to see if we can help or take one of our installer classes and become a Metal Roofing Systems Certified Installer? 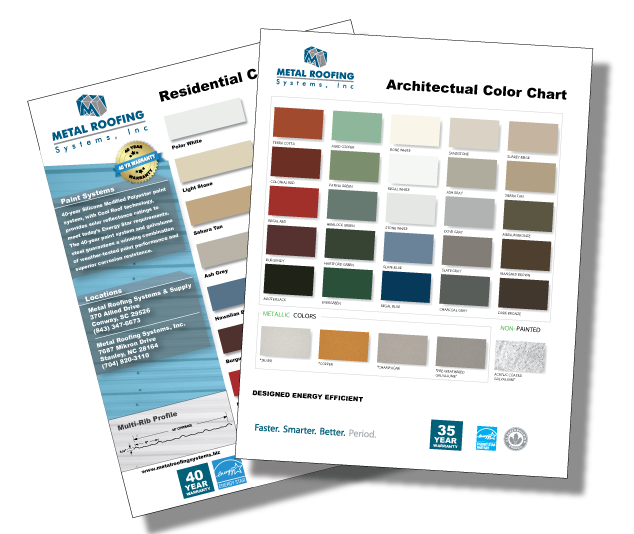 Lets make Metal Roofing easier for everyone!